When the image of your meeting room and training room reflects the high standards of your business, select Meeting Plus. Blending contemporary design with uncompromising durability, Meeting Plus style and construction will adhere to your meeting and training environments. 16-gauge steel frames and high-pressure laminate work-surfaces connect easily using threaded steel inserts making installation a snap. A selection of four shapes in multiple sizes lets you set up and reconfigure your meeting and training rooms in several configurations. 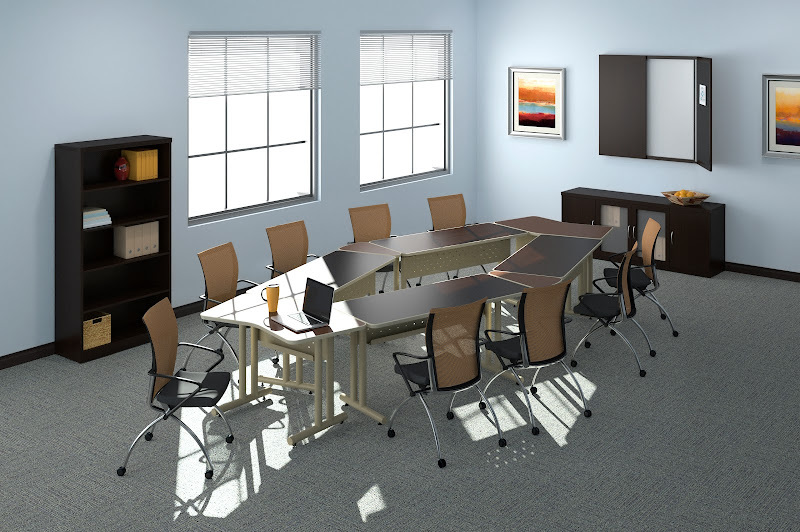 Meeting Plus tables have been redesigned to include two new important features: Cable management and mobility. Our top-of-the-line solution, Meeting Plus offers a substantial look and feel along with exceptional durability and a host of convenient features. Fixed leg training tables offer flexibility and durability in a clean contemporary design. Modesty panels connect to legs for added strength and come standard with new cable management features. Multiple sizes and shapes. Seating on both sides without panel. Support products, such as the Presentation Cart, A/V Stand, and Hospitality Cart, complement any meeting or training environment. Fixed leg training tables offer flexibility and durability in a clean contemporary design. Modesty panels connect to legs for added strength and come standard with new cable management features. Multiple sizes and shapes. Seating on both sides without panel. Support products, such as the Presentation Cart, A/V Stand, and Hospitality Cart, complement any meeting or training environment. The Lighted Lectern has consistent design details with the 1010PC, 1010AV and the Hospitality Cart. It has an all steel construction, and perforated column detail. The platform height adjusts from 33" to 47" in 1" increments without the use of tools or knobs. The platform is 21"W x 16"D with paper stop. There is a light included - 25 watt, UL approved, with an 8' cord. It has integrated wheels for easy mobility. It ships through UPS. Fixed leg training tables offer flexibility and durability in a clean contemporary design. Modesty panels connect to legs for added strength and come standard with new cable management features. Multiple sizes and shapes. Seating on both sides without panel. Support products, such as the Presentation Cart, A/V Stand, and Hospitality Cart, complement any meeting or training environment. Mayline Meeting Plus Table - 18" x 48"
Mayline Meeting Plus Table - 18" x 60"
Mayline Meeting Plus Table - 18" x 72"
Mayline Meeting Plus Table - 24" x 48"
Mayline Meeting Plus Table - 24" x 60"
Mayline Meeting Plus Table - 24" x 72"
Mayline Meeting Plus Table - 30" x 48"
Mayline Meeting Plus Table - 30" x 60"
Mayline Meeting Plus Table - 30" x 72"
Mayline Meeting Plus Training Table - Cresent - 66" x 24"
Save up to 70% on Meeting Plus Classroom Tables, desks, conference tables, cabinets, and reception area furniture. 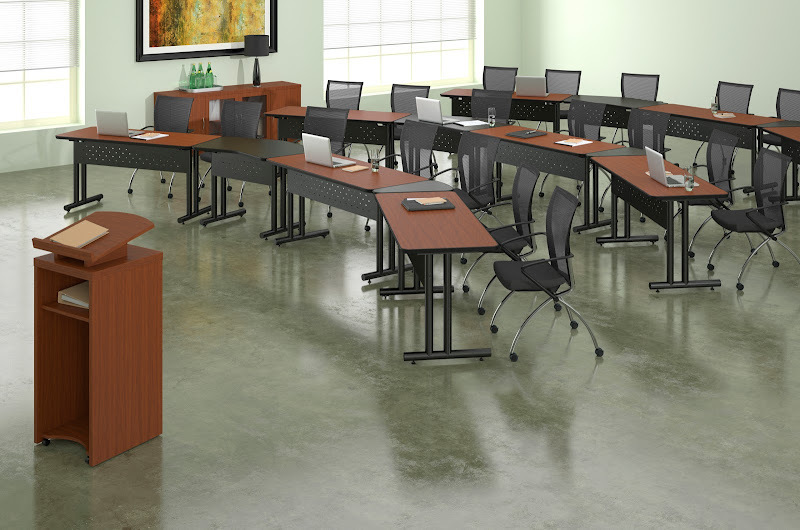 As an added benefit you receive FREE SHIPPING on all of our Classroom Tables.